We do not own a home. We don't even rent a home. Right now, we are in the pathetic position of crashing with my in-laws for the summer before we move into a two-bedroom apartment where we are just excited that the front door will open to the outside (as opposed to our last high-rise apartment, where the front door opened to a dimly lit interior hallway that always smelled of smoke and other questionable fumes). We likely won't own a home for several years yet (we need to dig ourselves out of some major student loan debt before we tackle mortgage debt). But! That doesn't stop a girl from dreaming. Yes, we have big plans for this future/hypothetical/dream home of ours. Is it some fancy kitchen? Some spacious game room? A walk-in closet just for my shoes? Nope! I have no idea what the rest of this someday house will look like, but the husband and I have definite visions for one room in particular: the library. Dark wood, I think. I don't always like dark wood, but it feels fitting in a library. 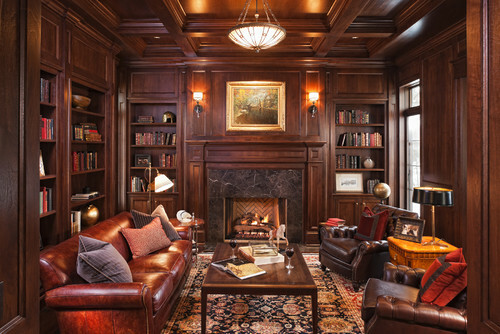 Dark wood paneled walls and shelves, with a big old fireplace and a bunch of cozy chairs (may or may not be leather, I'm not sold on the leather) and little reading lamps tucked away in nooks. Sounds super cozy. 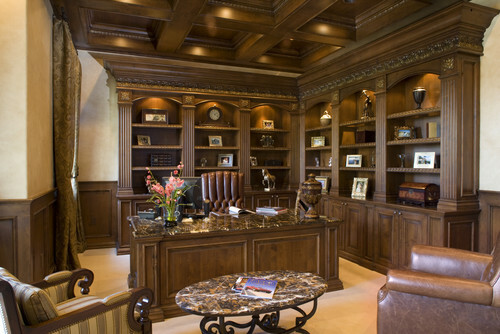 Traditional Home Office by Las Vegas Interior Designers & Decorators Macaluso Designs, Inc.
Hm, I love the idea of a cross-beamed ceiling. Makes it feel rich or something. Also, a big solid desk, necessary if this room is going to double as our home-office. Haven't decided that one yet, we'll just have to see how many rooms this dream house of ours has. But I also love the idea of a few display shelves for all of the artifacts we pick up from our (also future/theoretical/dream) world travels. A few framed maps on the walls (of the places we've been). Our large silk rug from India on the floor. A nice globe in the corner. That kind of thing. And then, something special, just for fun. 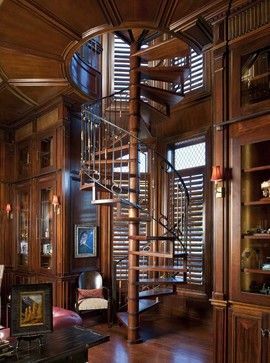 Like a spiral staircase. 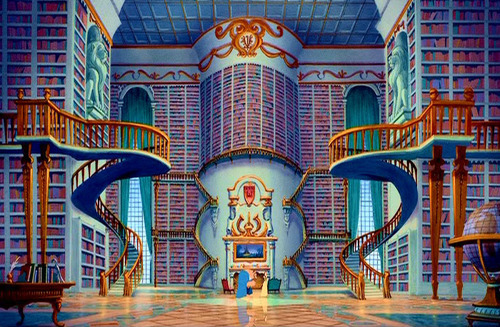 I mean, if this is a two-story library (which I wouldn't mind at all if it were), we're going to need a staircase. This is obviously going to be the most awesome room in the house.